Several non endocrine organs and cells also produce hormones, which are chemical messengers secreted into the blood and bind specific receptors on target cells to produce specific response. Thymosin activates lymphopoiesis and promotes T-cell genesis. They also suppress neuromuscular activity by inhibiting acetylcholine release. Hyperactivity of thymus causes myasthenia gravis. The photoreceptors produce melatonin while the amacrine cells produce somatostatin. Atrial natriuretic peptide (ANP) has also been isolated from the brain tissue. Brain natriuretic peptide (BNP) is present more in the human heart especially ventricle but also occurs in the brain. C-type natriuretic peptide (CNP) is present mainly in the brain, pituitary, kidneys and very little in the heart. 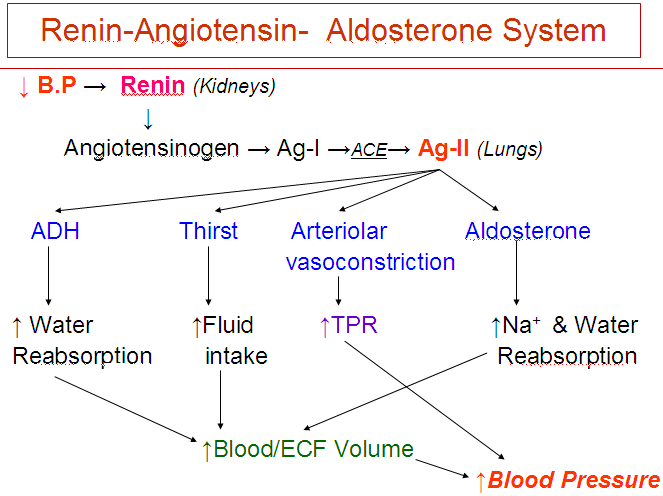 ANP and BNP act mainly on the kidneys to increase sodium excretion. (Injection of CNP has similar effects. Dilatation of afferent arterioles and relaxation of mesangial cells increases the glomerular filtration rate. Inhibition of Na+ reabsorption in the renal tubules occurs. Increased capillary permeability leads to extravasation of fluid and a decrease in blood pressure. The relaxation of vascular smooth muscles in arterioles and venules occurs (CNP has more dilatory effect than ANP or BNP). Inhibition of rennin secretion and counteract pressure effects of catecholamines and angiotensin II take place. Pineal gland secretes melatonin. This is a timing device to keep internal events synchronized. Nerves from the visual pathways enter the pineal gland. Melatonin production is highest at night and lowest during the day (circadian rhythm). It plays no role in regulation of skin color. Controls sexual activities in animals by regulating seasonal fertility. Inhibits reproductive functions- i.e. in animals, longer nights mean more melatonin as occurs during winter, so is an indication that it is not the time to reproduce. Protects against damage by free radicals. The duration of melatonin secretion each day is directly proportional to the length of night. Human chorionic gonadotropin maintains the corpus luteum for the five and a half weeks. It is similar to LH and exhibits TSH like activity. It stimulates the secretion of testosterone by developing testes in XY embryos. Estrogen stimulates the growth of myometrium and helps the duct development in mammary glands. It inhibits GnRH and PRL and promotes uterine sensitivity to oxytocin. Progesterone suppresses the uterine contractions and GnRH. It causes formation of cervical mucus plug to prevent uterine contamination. It helps in development of alveolar tissue in mammary glands. Human chorionic somatomammotropin is similar to GH and PRL and cause shunting of greater quantities to glucose and free fatty acids to the fetus. It causes lipolysis and sparing of glucose in mother thus has diabetic-like effect. It helps to prepare the mammary glands. Relaxin softens the cervix and loosens the connective tissue between the pelvic bones. Placental PTHrp increases the maternal Ca++ and mobilizes Ca++ from maternal bones.